The Oakland Raiders officially announced their new-look television broadcast crew for the 2018 NFL preseason. 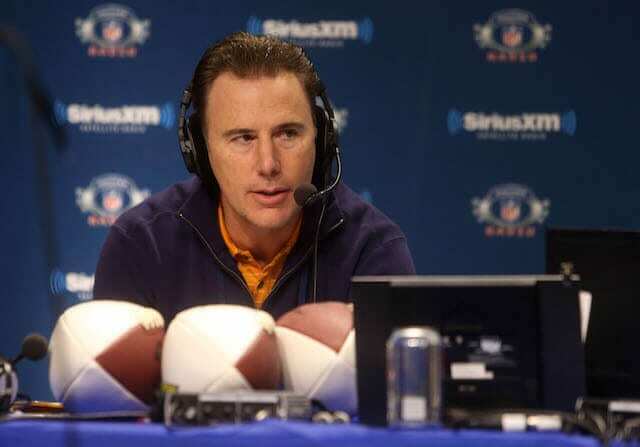 Rich Gannon is the latest addition to the booth and joins four-year returnees Beth Mowins and Matt Millens. Gannon, who most recently served as an analyst for Green Bay Packers’ preseason games, returns to the Raiders organization with plenty of broadcasting experience under his belt. Gannon once hosted his own show on Sirius XM Radio and currently calls games for CBS Sports, a position he’s held since the 2005 season. Meanwhile, Mowins reprises her usual role as play-by-announcer and Millens returns as color commentator. John Tournour, better known as JT the Brick, will continue serving as the Raiders’ television sideline reporter in the preseason. The Raiders also revealed major changes to their radio broadcast team for the 2018 NFL season, headlined by Brent Musburger, who supplants Greg Papa as lead play-by-play announcer. Musburger is joined by former Raiders offensive tackle Lincoln Kennedy, who was promoted to color analyst after spending the previous three years as radio sideline reporter. Chris Townsend will instead fill that vacancy in his first season as part of the crew. The Raiders kick off preseason play on Aug. 10 when they host the Detroit Lions in head coach Jon Gruden’s return to the Oakland Coliseum sidelines.